Many of the single family Aberdeen homes for sale are within walking distance of the train station. 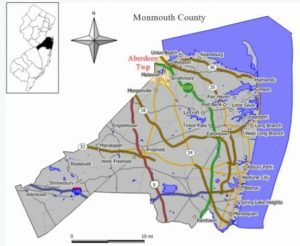 Aberdeen is located in the northern section of Monmouth County. The homes in Aberdeen are near the Garden State Parkway exit 114, Aberdeen also has Route 35 in the immediate vicinity. Commuters like Aberdeen because the train station serves the New Jersey Transit North Jersey Coast Line. As a result, Aberdeen an ideal location for commuters to New York City. The schools are part of the Matawan-Abrdeen Regional School District, serving children from homes in Aberdeen in grades K – 12. High school students also have the option of attending the Monmouth County Vocational School District. Specialized courses are available in fields such as computer science, and biotechnology. Also courses in the medical and science fields are available, among others. Additionally, there are many private schools in the area. The town covers an area of 5.4 square miles, with a population of more than 18,000 people. Aberdeen’s homes are a mix of residential housing with either single family homes or condos. Also there is some light industry and shopping centers. The town has two volunteer fire companies in addition to two volunteer First Aid Squads. In fact, there are a number of restaurants in the area. There are major malls nearby in Freehold Township, Eatontown and Edison. The 2010 Census reports a population of 18,210 people. The household median income was reported to be $89,365. The median family income was reported as $101,174. Over 6,500 households were in the town at the time of the census. For recreation, there are numerous parks within the town limits. These parks offer at various locations, swings, basketball, soccer fields, baseball fields, football fields, volleyball and more. A section of the Henry Hudson Trail passes through. This trail is for both hiking and bike riding.